so do come and browse our selection and swap your favourite reads. your wellbeing and outlook. 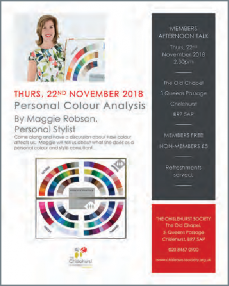 There are only 40 places available to our members so you must book your place. We are also opening the Old Chapel for a Christmas Grotto on December 1st from 1pm. We will have local history books for sale with some authors poised to sign copies. This includes our newest publication ‘The Forgotten Banker’ by Tony Allen. There will be posters and cards on sale too. Come along and tick off some of your Christmas list! If you want to get involved with your community come along on a Wednesday morning and chat to us about getting stuck in. 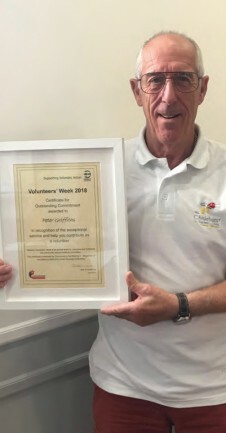 Peter Griffiths, who helps us every week, received a volunteer recognition award from the Mayor of Bromley this summer. Congratulations and a big ‘thank you’ to Peter. Also our volunteers are available every Wednesday in the Old Chapel hall between 9am and 12noon. As we see on the news, retailers are under huge pressure as the nation’s spending habits change, and as banks drastically reduce their number of branches. Of course, the economics here are fairly simple: if we want to retain a healthy and vibrant High Street in Chislehurst we need to make use of the shops, restaurants and services there. 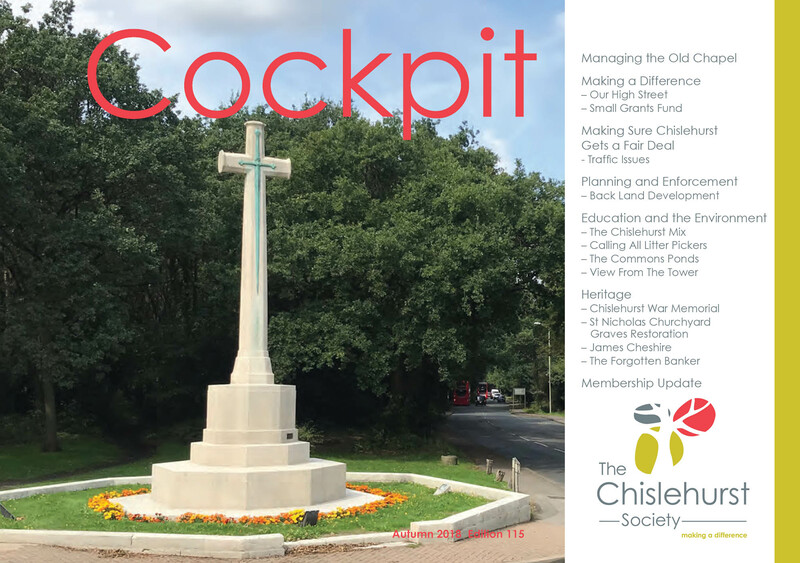 That ‘use it or lose it’ thought lay behind the Chislehurst Society’s Reward Scheme, launched in May and featured in the last Cockpit. We are currently busy recruiting new businesses to the scheme, so please do take advantage of it and help to sustain our local economy. In addition to supporting existing concerns, the Chislehurst Town Team acts where it can to attract new businesses to the area. When a shop closes on our High Street the agents often struggle to get interest in those premises from anything other than beauty and nail salons, tattoo parlours and fast food outlets. The Town Team tries hard to find alternatives and engage with landlords and potential tenants where we can, to ensure we have businesses that are a suitable fit. But that isn’t always possible. For example, when Gusto closed we understood the landlord was only interested in letting the property to a restaurant chain of at least 5 existing outlets. Bang went our hopes for an independent restaurant here, as did the hopes of a high-profile restauranteur that we have been talking to. The positive news is that the chain that is coming is Giggling Squid, which has a very high reputation for authentic Thai food. They plan to open before Easter next year. In fact, recently, applications for change of use of properties on the High Street has commanded much of the Town Team’s attention. 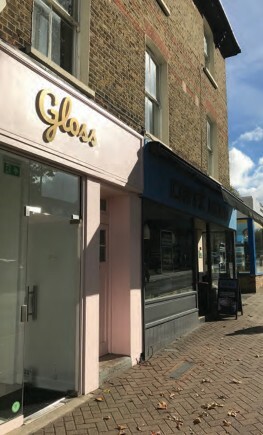 The property at 14 High Street has now opened as Gloss. When a very similar planning application was submitted for 72 High Street (formerly Zara Louise) we felt that, with a significant variety of beauty businesses on the High Street now, we should voice strong reservations about yet another. With that we did some marketing ourselves, finding another business interested in the premises. We have just heard however, that the planning sub-committee have disappointingly approved that change of use. 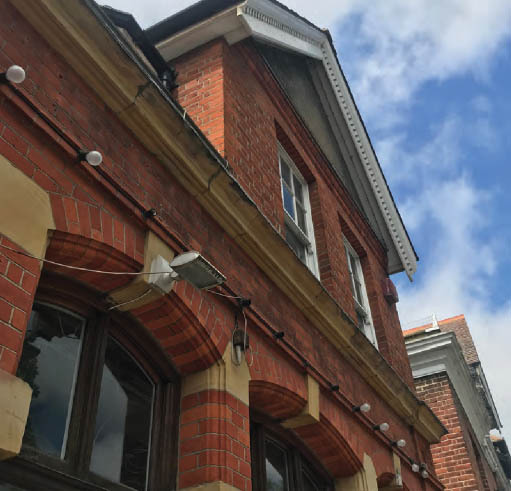 Just recently the Council gave permission for the conversion of the former NatWest Bank premises (11 High Street) into a bar. Chislehurst High Street’s future is clearly dependent on it being both a shopping and leisure destination. So, whilst recognising and respecting the understandable concerns of some local residents, we saw also that the application could compliment the development of the Street’s economy. We will now work with the new owner as plans are developed further. We are presently in the dark as to the new owner of 61–63 High Street (formerly Santander). Although completion had been expected in August there have been delays. As soon as the new owner is known we will try to engage them in conversation about their plans for this key site. The situation at 27 High St (Crosseyes) is similarly caught up in legal process. We have spoken to the owner who is keen to get access to his property so that he can let it back out again, but cannot do so until that legal process has been completed. We have introduced a couple of possible tenants to him for when that time comes. Remaining on the subject of protracted legal negotiations, we understand the development agreement for the Library should be finalised imminently. Once this full commitment has been confirmed the agent can proceed with the planning application process (they are appointing a planning consultant to deal with all the outstanding issues raised by the planners). We are expecting a consultation when local residents and interested parties can make observations about the scheme. We are sure this will invite keen discussion! With KFH moving a few doors up the High Street in August, the former Davina is now occupied; but the ground floor office unit at 57 High St is now on the market with Linays Commercial. Readers may have noticed that whilst the WC Block in the High Street car park was demolished back in February, the area has still not been reinstated. We have chased and chased Bromley Council on this, getting various responses and reasons. Suffice to say, disappointingly we do not expect it to be attended to any time soon. Also disappointing has been Bromley’s refusal to address a concern we have reported on behalf of wheelchair users. 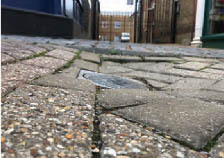 There are a number of spots where the uneven nature of the pavements inhibits wheelchair use. contractor’s visits. And regarding High Street trees, we have at least ensured that the Council will plant a replacement tree outside Zizzi in the next planting season. 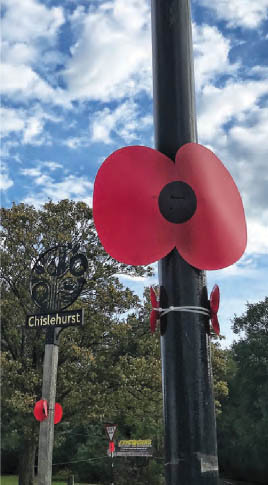 Finally, the Town Team are very grateful to the Chislehurst Society for agreeing to fund lamppost poppies in the High Street, Belmont Parade & Royal Parade. We are hoping businesses will go to town with their windows in the run up to 11th November. We are getting local schools involved to create poppies for the windows of some businesses. Can we help you keep Chislehurst special? The purpose of the Chislehurst Society is to make a positive difference for the people who live, work or visit here. With nothing but that thought in mind hundreds of residents have, since 1934, joined together and done their bit. Today we organise small but happy bands of litter pickers, event managers, coffee morning servers, talk givers and history seekers. In addition to all that voluntary activity we offer grants to others with ideas for enriching the lives of Chislehurstians young and old. In recent years we have part-funded a dozen different school projects; a variety of footpath and signage projects in Scadbury Park and the Hawkwood Estate; Scouts projects; the all-ability roundabout at the Rec. ; the gardens at Elmstead Woods station; a couple of church projects and purchased equipment for the Commons Trustees. Plus, our biggest single grant for some time, £20,000, means the Society has played a key role in bringing about the latest enhancement to the fabric of our town – the new pavilion at the Rec. Our ability to make grants owes everything to the generosity of those Members past who left the Society legacies. Respecting them – and our charitable objects – we naturally go through a formalised process to ensure we fund deliverable projects; projects led by people with the ability and commitment to deliver. That cannot change. Yet, when we look back at the proposals we have approved – and, indeed, rejected – there is a pattern: each was brought to us by a wellestablished organisation, be that a school, a church, or another charity. something … and then maybe some of us can just get on and do ‘it’ ourselves. Actually, the potential is endless. But maybe, just maybe what stops people asking the Society for help getting such ideas off the ground is a feeling that’s just not what we do. That we’re only here for the big ideas. Well, we’re not. We’re here to help anyone with an idea for making Chislehurst even more special for those who live, work or visit. So, over the next 12 months we’re setting aside £5,000 as a Small Grants Fund. Maybe all you need is a £100 for compost and plants. Maybe not even that, just some tools. Rather than put a limit on what ‘small’ means – or, for that matter, on what we will need to see to convince us the idea you have will turn into a reality, we just need you to talk to us. If you’ve got an idea – and a few people with you who believe in it enough to make it happen – send us a brief email outlining what you have in mind. Then, we’ll come along, take a look, listen to you, have a chat … and if we can, we’ll help. Simple as that. In recent years the Society has tried to engage our Council on the most pressing traffic issues affecting our home. Particular foci have been: the regular congestion at the Willow Grove / High Street junction; dangerous speeds in and around Belmont and the centre Commons; and the obvious need for a controlled pedestrian crossing at the War Memorial junction. Always, our priority has been the safety of pedestrians, cyclists and road users. 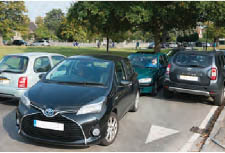 So, when our newly elected Ward Councillors asked, in July, to meet with us and colleagues from the Commons Trustees, to discuss ‘traffic problems in Chislehurst’, we hoped for engagement on a range of issues. Sadly, the meeting was a disappointment. 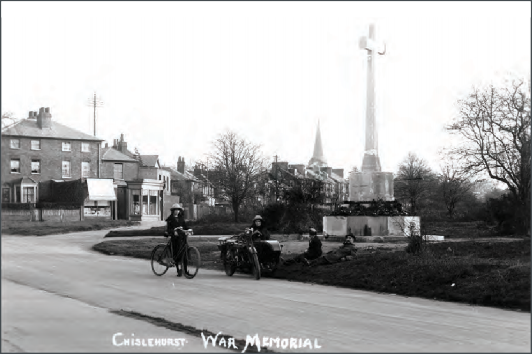 Whilst we were able to articulate some of the key concerns we understand Chislehurstians hold, the Council was all-but exclusively focused on one thing: getting us and the Commons Trustees to agree that what Chislehurst needs most is a major reworking of the War Memorial junction. And specifically, that the traffic lights there should be replaced by a roundabout, necessitating relocation of the memorial itself as well as widening of the A222 (being the route connecting the A20 / Sidcup and Bromley), requiring the surrender of part of the Commons. We did not agree that. We did not agree partly because the proposal seemed completely out of keeping with the historic and cultural importance of the Memorial and Royal Parade. But also, because much of the Council’s argument sounded paradoxical. 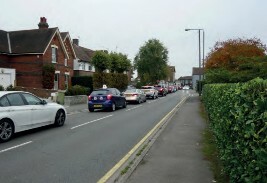 For example, it was suggested that only by speeding up traffic on the A222 could: i) an on-demand crossing be incorporated near the junction / roundabout – even though actual congestion there is restricted to peak times; and ii) traffic be calmed on the Green Lane / Ashfield Lane stretch, a route that observably is taken to avoid the War Memorial!? 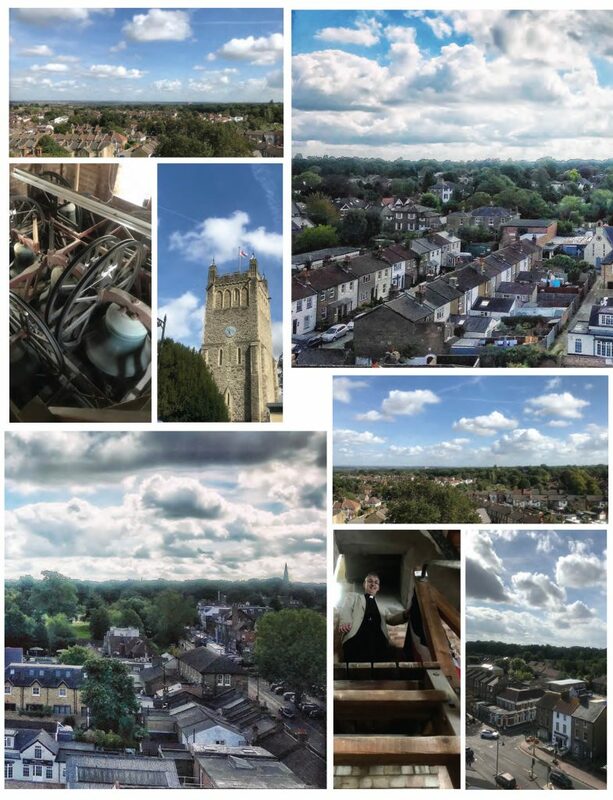 So, in an effort to move the discussion on we said the Society would engage with Chislehurst’s residents and businesses in an effort to draw together for the Council a picture of the safety problems that matter most to us. Because, we believe that is the key point: people are entitled to feel safe walking, cycling or driving around the area. Of course, as already said, we had an idea of the key issues from your past comments and previous surveys we have conducted. In addition, in places such as Green Lane and Ashfield Lane active residents have formed their own action groups, doing their best to draw the Council’s attention to the problems – especially speeding traffic – affecting them. careful revisions to the road layout across the centre Commons (Green, Heathfield and Ashfield Lanes) would moderate drivers’ behaviour and so speed. So, how do we get the Council to take these points on board? The answer is we must all get active. people living in, working in or just visiting Chislehurst. The Society will collate all the comments and ideas we receive – be they in writing or on the 25th – and pass a summary on to our Council. In addition, you may want to write to our Councillors direct yourself, to tell them what you think. Maybe they aren’t seeing the picture from your point of view because they don’t hear it often enough. Maybe the only people they do hear from are those who would like a roundabout at the end of Royal Parade. If that’s not what you want, write to them and say so. In addition, if you live near Green Lane or Ashfield Lane, join the campaigns there. If you have issues you want addressed, create your own specific campaign – we’ll help you however we can. Hope to see on the 25th. Given the pressure to facilitate more house building we are likely to see an increase in the number of planning applications for houses on ‘back land’; i.e. 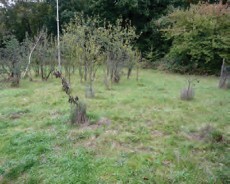 land surrounded by existing properties. They may arise as a proposed dwelling immediately behind another and sharing the same access to the highway; often referred to as ‘tandem development’. In such developments noise disturbance and lack of privacy may be unsatisfactory for the occupiers of both houses. And there may be adverse impacts on the amenities of neighbouring homes on plots backing on to the new house. 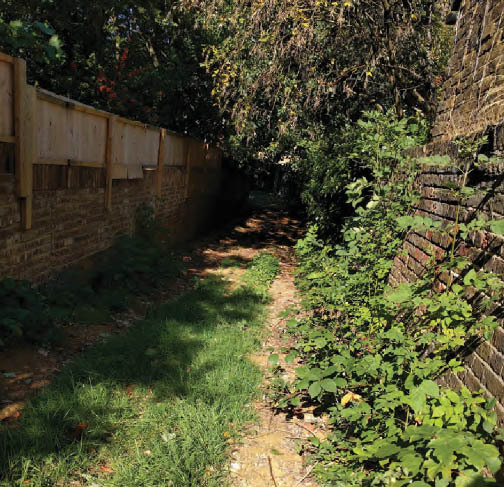 When the Society’s planning team review planning applications (within the Chislehurst Ward/post code BR7), we are aware that some corner plots may have the potential for an independent development in the back garden that could be severed from the host dwelling. We are mindful that such development could adversely impact on the character and appearance of the locality and harm the amenities of neighbouring homes. Within Chislehurst there are many buildings tucked away behind frontage properties and accessed by narrow tracks. They may have had a varied history of uses including workshops, storage, builders’ yards, small offices, or discarded blocks of garages etc. The shared characteristics of such properties include redundancy of the original use of the buildings, deterioration in condition of the building and any surrounding space, and the prospect of occupation by unauthorised people and potential antisocial behaviour. A recent application for the redevelopment of derelict garages on back land near to Royal Parade illustrates the significance to the planning decision of ‘ease of access to the plot’ or rather the difficulty! In this instance the access track to the plot is narrow, almost 100m long and with a tight right-angle turn. For this, and other reasons, planning permission was refused. Among the matters raised by The Society in its objection was “The access by vehicles of the emergency services will be very difficult if not impossible”. A recent planning appeal in south London is relevant. It related to the refusal of planning permission for residential development on a landlocked site reached only by a narrow vehicle track. In dismissing the appeal, the Inspector observed that fire tenders would be too large to negotiate the vehicular track, and, to deploy fire hoses, the development would exceed the limit of 45m distance set out in the Building Regs. While this distance can be increased to 90m for a house with sprinklers installed, the Inspector reasoned that sprinklers are generally installed to allow more time for evacuation rather than to extinguish a fire. We were delighted that the Church of the Annunciation took part in Heritage Open Days this year and we love this image of Father Paul as our latest heritage guide, precarious positioning! A tower with a view. Can you spot the Old Chapel? The Mix is a day where students from schools across the area come together to discuss, debate, and present their ideas on different topics. The Chislehurst Society has been supporting The Mix at different schools since 2011. 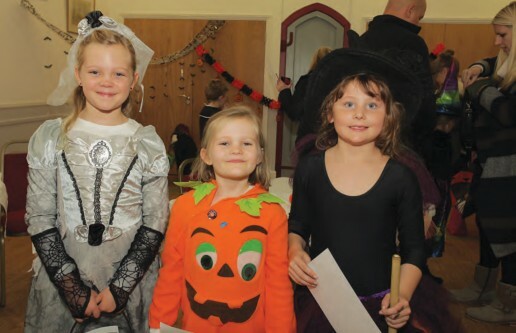 This year, Farringtons School was the host of a very successful and positive event for even the shyest of youngsters. Over the course of the day, all of the students completed four activities focused on Chislehurst. The first topic of the day was about how we can make Chislehurst healthier, which raised some really important topics, such as: mental health, healthier eating, and longterm improvements to life. The session consisted of a discussion, followed by a heated debate about how we can make Chislehurst healthier. There were some incredible presentations encouraging people to reduce air pollution, walk to school, and eat healthier. 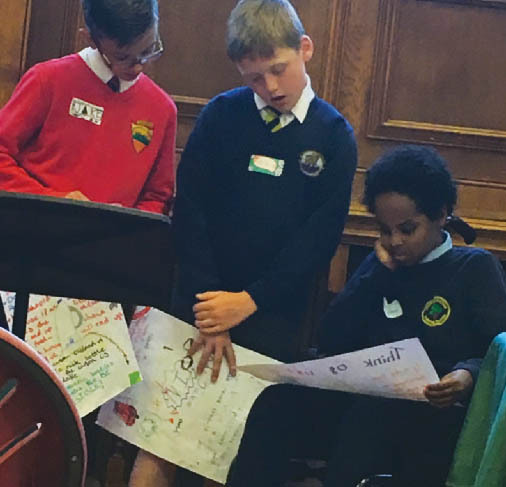 The overall effect of these presentations really showed how we should listen to the younger generation’s opinions, as their opinions were far better than any politician! The second topic was about reducing our plastic waste. The student’s presentations were very informative, and encouraged us all to swap our plastic for a more environmentally friendly resource. 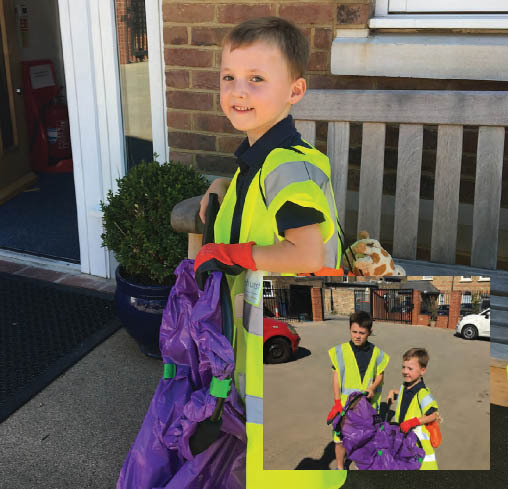 The introduction of recycling bins was certainly an option that most schools consider. Perhaps the most important point we can take from the day was “Don’t stop – take action!”, showing all of us how passionate everyone was about their arguments, and encouraging us to change things in our own lives to reduce the amount of damage done to the environment by plastic. The third task was to produce a radio advert and jingle to promote visiting Chislehurst. With some incredibly cute jingles, some really enthusiastic promotional points, and an overall encouragement to come to Chislehurst, it was certainly a highlight of the presentations. Debates are known to be powerful, enthusiastic, and about key issues, including this year’s debate about who you would keep on a desert island and why – well, I mean it is important – if you ever get stuck on a desert island, right? All of the people were linked to Chislehurst in some way, and, as a group, everyone had to decide who they would save based on a general overview of their lives – a difficult task! 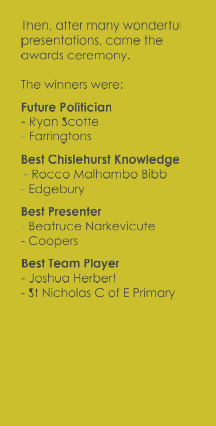 The debates did seem to be a real highlight of the day, with numerous pupils telling me that “hearing other people’s opinions on different topics was really interesting”, and Beatruce Narkevicute from Coopers told me that the best part was the “acting – everyone got into it, everyone was participating, and no one was left out”. Showing the true community spirit of the Mix. If you are as concerned as we are about the ever-present amount of litter that scars our commons and roadsides – do join us for our bi- monthly litter pick! We meet at the Old Chapel, Queens Passage, at 10am on a Sunday. Kit is provided as well as well-deserved refreshments and cake on your return. So, come and give it a go and see the difference. Looks like some youngsters did just that. Thanks Danny and Teddy for your enthusiasm, lets hope it inspires others to join you next time. If you are thinking ducks, geese and fish, what follows may be a surprise… There’s a lot more life in our ponds if you look closer. What’s more, the small invertebrate inhabitants are a key part of an increasingly threatened habitat. Over the last century over 50% of Britain’s ponds have been lost due to number of factors, most associated with human activities. The ever-present threat of pollution is another major concern, with around 80% of remaining ponds showing signs of deterioration, with consequent loss of species normally associated with a healthy pond. 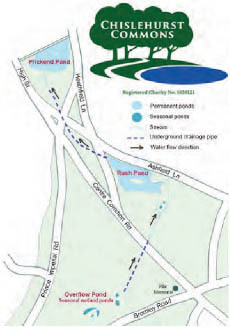 Given these concerns, we are lucky the Commons still has Prickend and Rush Pond, along with a seasonal wetland of temporary ponds, known as the Overflow Pond that drains to Rush and eventually Prickend Pond. But what state are they in? 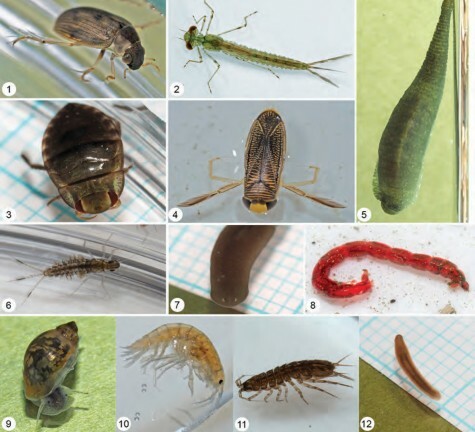 As a new Commons volunteer, with a background in zoology, a survey of invertebrates was my first thought for assessing the ponds, as different pond conditions are reflected in the groups found. Assisted by a small group of eager volunteers, we set about a systematic net survey of Prickend and Rush Ponds. Many of those helping hadn’t got this close to the ponds before, so it was a revelation what turned up in the net. (see photos). There was certainly a lot more going on than a passing glance at a pond might suggest! A score based on the invertebrates found indicated that both ponds weren’t in the top league – more in the 80% group showing signs of poorer conditions. That said, Rush Pond came out slightly better than Prickend, and by taking a closer look at the individual habitats within the ponds it was possible to see some encouraging trends. Anyone looking at Prickend Pond will have noticed the large expanses of bare silt – here we found mainly aquatic worms and fly larvae that are characteristic of the poorest conditions. Elsewhere, mainly in the recently planted margins, things looked a lot better with species associated with better conditions e.g. insects (water bugs and Damselfly larvae) and snails which score higher. Look at Rush Pond and there are more submerged plants and given its more natural location on the edge of woodland it has more potential for wildlife. Many species found were common with Prickend but importantly (and raising the overall score) were higher scoring indicators of better conditions – water beetles, water shrimps and larvae of one of the less common “Emerald” Damselflies. Importantly, these results give us a benchmark to measure future surveys (including botanical and water analysis) against. 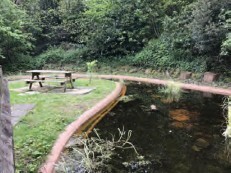 This information will be invaluable to the Trustees of the Commons to help identify issues and explore potential improvements for the future wellbeing of the ponds. The Chislehurst Society was proud to pay for the War Memorial to be cleaned this year ahead of the Centenary of the Armistice that ended The First World War. 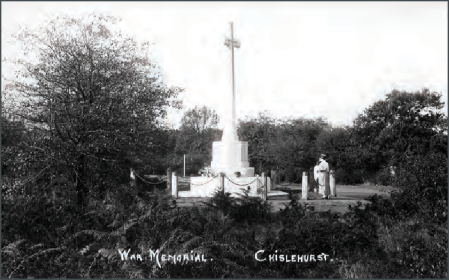 It was unveiled on 17th October 1920 as a result of the efforts of the War Memorial Committee to provide a suitable memorial to “those from the Urban District of Chislehurst who laid down their lives in the Great War”. The Conservators of the day gave permission for it to be erected on the common, and agreed to take over the maintenance of the site after the War. The Committee was set up at a public meeting on 22nd January 1919. Local organisations were invited to send representatives and further public meetings were held so that everyone could be involved. An appeal was sent out on 1st August 1919 by post to every house in the Parish, and, by 13th October, £1437. 19s. 0 had been raised, made up of amounts ranging from one of £250 to 43 amounts of less than £1. 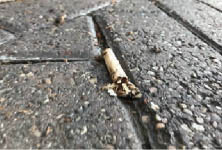 There was some discussion at the next meeting about continuing to collect the small amounts, but it was generally felt that everyone should have a chance to contribute. It was decided to ask Sir Reginald Bloomfield RA, to erect a monument of a design he had exhibited at a Special Exhibition at the Royal Academy. The site at the crossroads would have a beautiful background of thorn trees with the birch trees of the Common beyond and had exactly the right aspect. He quoted £920 for the work, and recommended a firm from Torquay to carry it out. The monument was made of Portland Whitbed stone. There was no official list of casualties, so a provisional list of the names to be included was made from the personal knowledge of the Committee, and it was agreed that this should be sent to the “Distinct Times” and displayed in the porches of places of worship, so that corrections and additions could be made. The Committee agreed unanimously that the names should be inscribed in alphabetical order without rank, regiment or honour. The foundations were started on 26th July 1920 and the work was completed on 1st October 1920. Sir Reginald reported that he was very pleased with the monument and considered it one of the most successful he had erected. It was proposed that it should be surrounded by posts and spiked chains, one to be detachable to allow access, and Sir Reginald was asked to design them. Following the dedication ceremony, a Trust Fund was set up for the surplus funds of about £900 which were given to Cray Valley Hospital, with three named trustees. Three ladies from the Committee volunteered to see to the removal of dead flowers. The War Memorial Committee was wound up in September 1921. Coolings Nurseries provide the plants around the memorial and the Commons Keepers made sure they survived the recent long hot summer. To learn more about the casualties, please read the book ‘For King and Country’ by Yvonne Auld, available from St Nicholas Church and Paper Lane on the High Street. grave also lists his son, Lieutenant Edward Balme, MC, who was killed in action on 22nd April 1918. 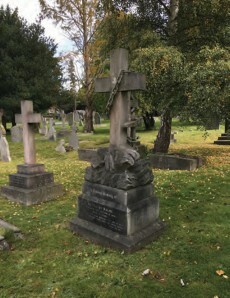 A second grave in the churchyard, that of Walter Murton has been made to stand upright where previously it was leaning. We felt it right to honour those Chislehurst worthies who did so much to protect the environment we enjoy today. In the churchyard at the rear of the Annunciation Church is the grave of a soldier from the First World War. His name is not on the village war memorial nor on the Commonwealth War Graves Commission website. Although James Cheshire was killed in action in France on September 30th 1918, this is a rare example of the body being brought back to the UK. 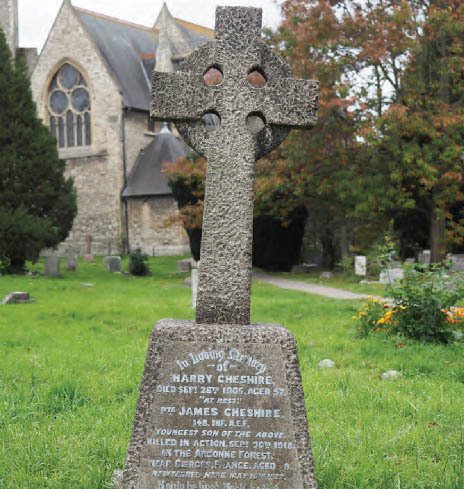 The Sidcup and District Times report of May 19th 1922 explains the circumstances: ‘The funeral took place with military honours of James Herman Cheshire, who was killed in France and whose body has been disinterred and brought home to England for reburial. James was the son of well-known Chislehurst residents, Mrs Cheshire and the late Mr Henry Cheshire of 8 Frognal Villas, Green Lane. James left this country in 1911, when he was 20, to join his brother who had a large meat market in America. When the war broke out James joined the American Expeditionary Force and was sent to France in June 1918. He was killed in the Argonne Forest and was buried there. Mrs Cheshire was officially notified as to the location of the grave, and last week she was able to have the body brought home. The coffin reached Southampton and was brought to Chislehurst. The reinterment took place at two o’clock on May 16th, Rev Serle conducting the service’. 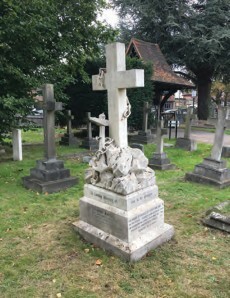 The grave can be located at the rear of the churchyard, to the right of the footpath near the exit into Alexander Road. The general rule was that British and American servicemen were buried and remained in the country where they died. However, it would appear that as James was an American serviceman, born in England, he could be brought back to England but not as a British soldier or an American returning to the USA. The Tiarks were a well-known and much-loved Chislehurst family, living here for over one hundred years from 1877, and renowned for their support to the local community. Frank Tiarks was one of the most interesting. Born in 1874, he was brought up in Chislehurst, but went to sea at the age of fifteen. On the death of his elder brother, Frank resigned his commission with the Royal Navy to join his father as a partner in Schroders, which he transformed into the world’s leading merchant bank over the next fifty years. He had a life-long love/hate relationship with Germany: his grandfather was German, his business partner, Baron Bruno Schröder, was German, and he married a German girl. But Frank was resolutely British. He made huge contributions towards British victory in the Great War, including two years working in Naval Intelligence to counter the German U-boat threat. Later, as a Director of the Bank of England, he averted a catastrophic threat to international capitalism and democracy, when, almost singlehandedly, he persuaded the German Government to step back from the brink of declaring national bankruptcy. 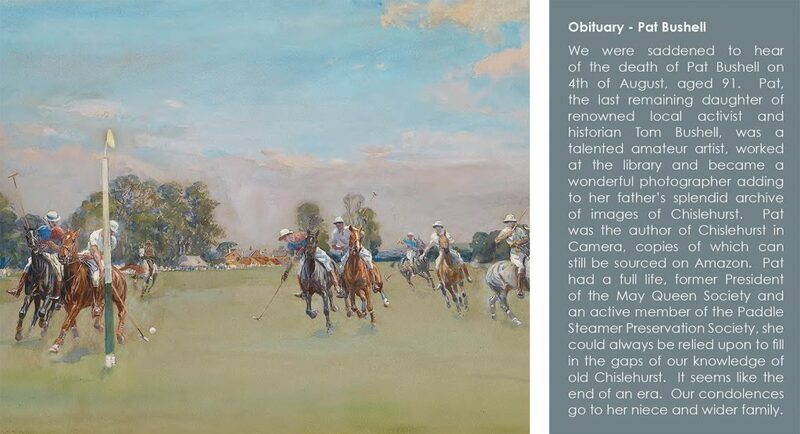 You will also find much about Frank’s sporting life, including the creation of the polo ground on the Homewood Estate, where annual tournaments were held in the 1930s. Much of the information about Frank’s life has come from letters, diaries and photographs in the possession of his grand-daughter, Henrietta, Duchess of Bedford. She provided Tony with unfettered access to her family’s archives, and has kindly given permission for these to be used in the writing of this book, the first ever full-length biography of this remarkable man. Down Load a copy of this File size 43MB do they want a download function????? Our membership numbers are on the up thanks to the canvassing work of Peter Miller. Peter is now armed with a card reader so it will be possible to pay any outstanding subscriptions in a 21st Century way! The Reward Scheme is going well but if you are shopping on the High Street and the local business is not part of the scheme why not encourage them to join up? We have added one more afternoon talk, free to our members, this year. 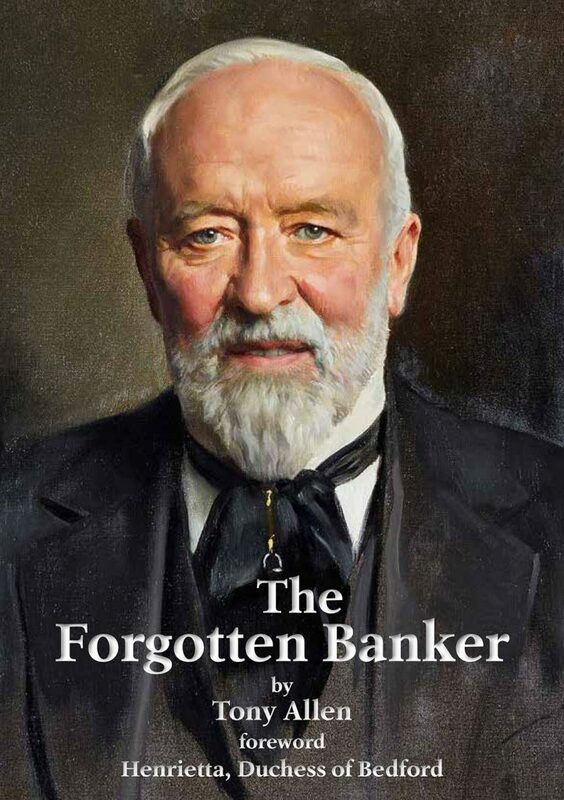 The Forgotten Banker by Tony Allen on 29th November 2.30pm at the Methodist Church. In future all our speakers at these talks will be wearing a lapel microphone to improve sound quality.